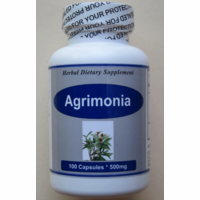 Agrimonia product is a natural herbal dietary supplement, formulated from a concentrated extract of the Agrimonia pilosa herb. This herb has wonderful qualities that may support normal blood coagulation and normal production of healthy platelets. Suggested Usage: As a dietary supplement, take 3 capsules each time, three times a day, or as suggested by a healthcare provider. Agrimonia is an herb traditionally used in Chinese medicine for a wide variety of health supporting qualities. Agrimony leaves are rich in vitamin K and are traditionally used to promote blood clotting and control bleeding . The plant contains agrimonin, this is haemostatic, cardiotonic and been known in TCM to lower blood sugar . The root is an astringent, diuretic and tonic . * It is also been traditionally used to stop episodes of bleeding including coughing blood, vomiting blood, nose bleeding excessive vaginal bleeding (not during menses) and dysentery with bleeding.